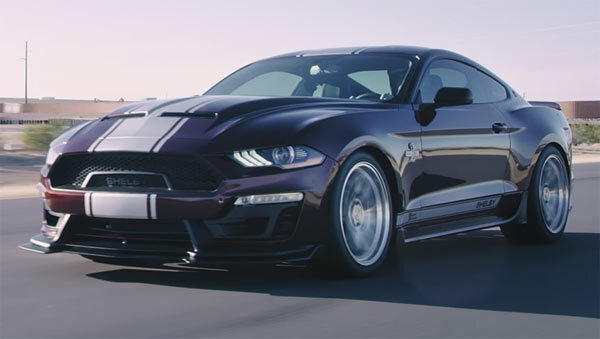 Shelby have been offering the Super Snake package since 2015 offering 750 Hp from its successful 5.0-liter V8. Now the packages has been updated for the 2018 Mustang, including the horsepower rating hitting the 800hp mark and more aggressive styling. The 800Hp comes from an optional upgrade with a Whipple supercharger, the standard being 710hp. Standard features include six piston front, four piston back Bembo brakes, 20” forged aluminum wheels, tweaked suspension, power bulge, new front splitter, side sills and ducktail rear spoiler. The optional upgrades include Penske-tuned track suspension and a rather tasty widebody kit. The pricing starts for the 2018 Ford Shelby Super Snake at $113,445 including the donor Mustang and will include a unique serial number and inclusion into the official Shelby registered. You also get a 3 year/36,000 mile warranty. The second video below gives you a preview of the optional extra Shelby by Penske suspension system.